She was so friendly, wanting to shake my hand, give me a hug, then finally she gave me a kiss. It melted my heart. 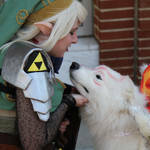 And how appropriate that i was the FemLink cuz there are so many crossovers now thanks to the wolf form in TP. Just to let those of you who cares, it is now set in stone that I will be revamping my Okami cosplay. This little meeting was a sign from the heavens themselves. Awww! X3 Glad you got kisses from Ammy. She must love you! What species is that dog... I WANT ONE TO HUGS! Wow the owner did a GREAT job!!! Sooo cute. Yea! I'm planning on doing more pics with them next month! It's one thing if you want to dress yourself as your fantasies, but why include innocent animals and paint them? I would never draw on my Husky... he's beautiful the way he already is and just as majestic... I'm just sayin. The dog was fine, he was very happy for all the attention, and it was water soluble paint which did no harm and the stuff on him was only a harness. It is not my dog, but i could tell he was having a great time. Okay good Cute scene regardless. And I'm redoing this outfit. I'll have a revision of it done for Anime Boston. Never seen a cosplaying dog before. AND it was from okami, which made me fangirl. We are planning an official shoot in April! i eat pankaces for binner and stummy yuff for dreakfast. i WANT THAT DOG! even without the costume, it would be adorable! it is like the closest thing to a wolf like EVER and i LOVE LOVE LOVE wolves and dream about meeting them stroking them playing with them and LOVING THEM! I don't care if it's FemLink, it's still LinkxAmmy. Thats what i was thinking. Its funny cuz Ammy is actually a He in this photo. Awwwww that is awesome! I love both of your costumes! So is that a real dog dresed up as Ammy or a suit?